Changing the layouts for single images is as easy and clicking on the image then using the corners to rotate or resize the image by pressing and dragging on an edge. If you wish a finer adjustment you can edit the positions in the picture1 tab. 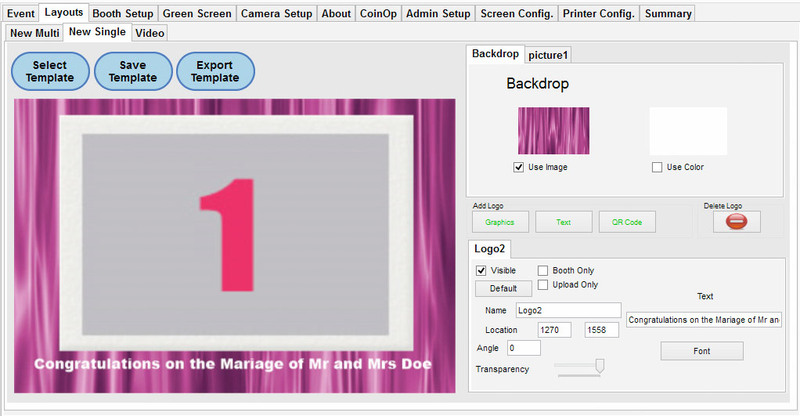 The background can be altered through the Backdrop Tab by selecting Use Image or Use Colour. Pressing either of these will provide a popup for selecting the image/colour of your choice. Add Logos or Text to the Image through the Add Logo ‘Graphics’ or ‘Text Buttons then either edit it’s settings below or click on the item in the preview to drag the image to the desired location. You can save this template by clicking Save Template for future use or alternatively if you have already saved some templates (some are already saved by default) you can click the Select Template and Choose one from the Thumbnails.